The world of surreal photography, in which Moroccan photographer and filmmaker Achraf Baznani has created through his photographs, have the photo world buzzing. His imaginative and wild surreal photography continues to inspire others and push their own creative exploration to its furthest depths. Resource Magazine spoke with Baznani about his surreal photography and what inspires him to create such compelling images. Can you describe to us your photography style? 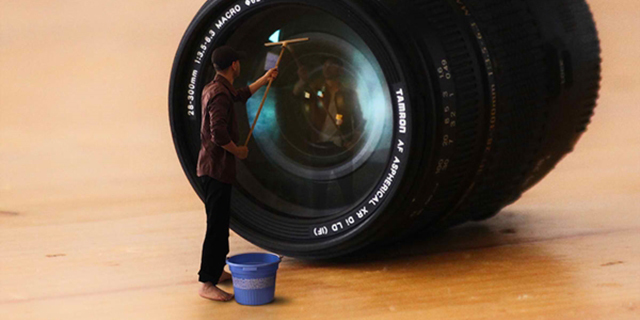 We call it conceptual photography, which is first and foremost about the concept of the photo. A conceptual photographer is trying to bring various messages to the viewer, be it a political advert or a social commentary or an emotional outcry. There is some level of abstraction, thus, in a conceptual photo, the image is not a definite illustration of the original idea but a general representation of the idea. Conceptual photography makes healthy use of graphical symbols to represent ideas, movements, moods, anything and everything that the photographer might want to include in the message of their photograph. Who are the photographers that have influenced you and how has their work helped shape your technique? Photography has more than one source of learning; which ones are looked at depends on the person. Personally, I’m a big fan of Hungarian photographer Robert Capa, particularly his immortal piece The Falling Soldier. This shot is one of the most valuable images of war in the twentieth century. That’s exactly what made me experiment with surreal and fantasy art and creating images that the human mind doesn’t believe. Can you tell us about the process of how you take photographs? There are a variety of ways a concept falls into place, most often it starts with a spark of inspiration and grows from there. Whether it’s a person, design or story that needs to be told, it all starts with a single point. From there it becomes simple problem solving. I don’t spend very much time looking at what other people are doing. I like to stay aware and connected to what others are doing by following sites such as Flickr but beyond that, I spend my time meeting people, creating and living my life. I think the best way to become inspired is not by emulating others, but finding what inspires you. Capture and share that. I use Photoshop CS4 and Lightroom 4. I use Lightroom to correct and change the colorimetry pictures. Then I go on to the most important part, Photoshop retouching. To learn how to master these tools, I spent hours in front of my computer studying the tutorials available on the internet. Be realistic and truthful to yourself. Understand what and how much you’re willing to sacrifice, be it school, your career, a social life or your income. It’s never easy to succeed and sustain yourself in the beginning. It can take people anywhere between half a year to even a few. It’ll take dedication and luck but hard work and perseverance is the key. Never give up, no matter how hard it is. Nothing is impossible. Any plans for a photo exhibit and can you tell us about your next project? Yes. Ever since I started photography it has always been a dream of mine to have my photographs printed up large and posted on the wall. Exhibiting my artwork is my biggest dream. I will publish my second photography book Inside My Dreams in the next few weeks. To check out more of Achraf Baznani’s works please visit his website.